Shooting ranges create a lot of noise. Standard materials allow sound to bounce from every surface creating long reverberation times. 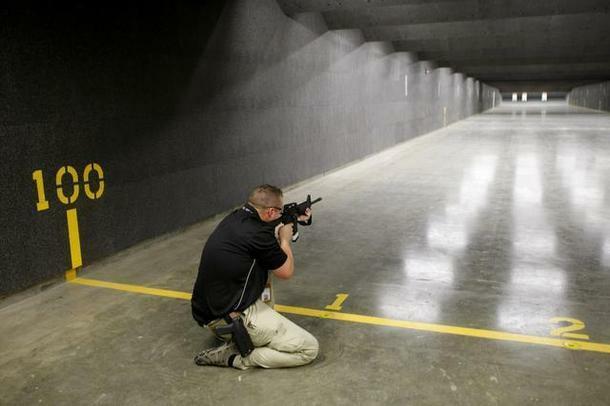 In addition shooting ranges are used when testing weapons or materials so walls and ceilings must be resistant to bullet fragments or other shattered materials ricocheting out of control. Quietstone have been in the acoustic market for over 10 years and have accumulated extensive experience of addressing these challenges. We can supply a tried and tested acoustic system ideally suited to a shooting range incorporating various products. Quietstone Light and Quietstone Standard are both excellent products for shooting range applications. Quietstone Light panels are to be used on the ceiling of the shooting range to absorb passing bullet noise. The Quietstone Light panels will absorb bullets which and not allow bullet fragments to ricochet. The panels should be bonded to the ceiling which means the balistic panels will not break when shot at. Quietstone Standard is more durable and heavy and should be used on the wall of the firing range. These panels are also excellent sound absorbing products and will also absorb bullet shots which could otherwise ricochet into the wrong direction. Quietstone standard panels should be bonded to the walls so that when bullets fragments hit the panels the panels don’t shatter.